Note: There is a $1,000 giveaway at the bottom of this post. Do you think you could tell the difference between a Coke and Pepsi? When I was an RA in college, my residents insisted they could, so I bought Cokes, Diet Cokes, Pepsis, Diet Pepsis, and a generic soda to test them. Of those who tested, every one insisted they could tell the difference. Only 3 out of 47 could. In fact, most of us can’t even tell the difference between Coke and Pepsi in a blind test — yet when presented with data indicating how we routinely fail to tell the difference, we insist that we’re different. Today’s book review is about a remarkable book, Sway, that details how we’re irrational, yet we fail to acknowledge it. Ori Brafman, a friend of mine, and his brother Ram Brafman write about how we insist that we behave methodically and purposefully — that we have an idea, and we act on it. Unfortunately, this ignores decades of research and great stories showing that our behavior is influenced by even the slightest of changes to our environment: We eat more because the plate is bigger, we remember things because they were presented in color on a loud commercial, and we invest in things because our friend told us about them. I got a review copy of this book and thought it was superb even before it became a New York Times and Wall Street Journal bestseller. I love exploring rationality and relating it to personal finance. For example, many of my friends at Stanford graduated with an economics degree, and many of them assumed that because they knew econ, they understood personal finance. In fact, my friend a bulge-bracket investment bank recently told me about an internal study they ran on their highly compensated portfolio managers. It turns out that the portfolio managers’ asset allocations were no better than average — an astonishing finding considering (1) how bad most people are at investments, (2) that these PMs are paid millions of dollars per year to manage professional portfolios, and that (3) asset allocation is responsible for 90%+ of returns. Sway is a book of fascinating anecdotes about irrationality, psychology, and financial findings. It’s a key book to understanding why we behave the way we do — and to changing our own behavior. I’ll pull out some of the most interesting findings here. You’ve seen me write about how credit card companies (and any good company) test their marketing to find the optimal solution. Here, for example, are two mailings that my friend received. Can you spot the differences? The Brafmans have a new wrinkle to add to this. “In South Africa, a consumer lending bank wanted to push personal loans to 50,000 of its customers. 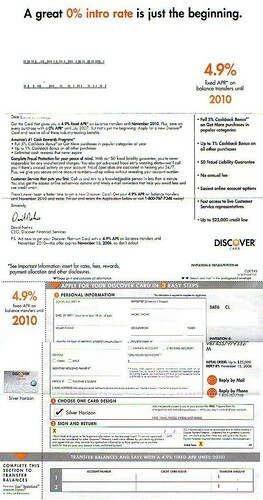 Working together with a team of economists, the bank crafted several variations on the same basic loan offer letter. The different versions were randomly assigned to recipients and mailed off without the recipients ever knowing that the letter they had received was part of an experiment. The letters included different interest rates (ranging from 3.25% to 7.75% per month); some featured a comparison to a competitor’s rate, others a giveaway…and still others a photo of either a man or a woman’s pleasant, smiling face. Malcolm Gladwell’s Blink does a great job of highlighting irrelevant information and its effect on our decision-making, but I found several interesting studies in Sway that I hadn’t heard of before. We’re more motivated by loss than by gain. This simple technique also explains why we pay more for subscriptions that we don’t fully use when it would be cheaper to pay a la carte: Beyond just convenience, we worry about being overcharged a huge amount one month. The framing of an offer is important. People criticized Coke when they tested raising their vending machine prices during warm weather to test price elasticity. Imagine the reaction had they lowered prices during cold weather. Whenever I write an email, I try not to use negative phrases. Again, the framing matters, whether in politics or personal finance. Once we commit to something, we use adaptive self-serving biases to adaptively construe results to support our decision. For example, in a classic case of post-decision attitudinal adjustment, once you buy a Honda Accord, you’ll be more likely to notice Accords and to seek our confirming evidence that you made the right choice (such as reading positive reviews and talking to other happy owners of Hondas). Not surprisingly, this affects us even in conditions of life and death, as the Brafmans compare LBJ’s commitment in Vietnam to President Bush’s commitment in Iraq. Why D.C. subway passengers walked past Joshua Bell’s free violin concert, when he normally charges over $1,000/minute to play (page 42). In a beautiful example of social psychology, the Washington Post asked famous violinst Joshua Bell to bring his $3.5+ million Stradivarius to L’Enfant Plaza in Washington D.C. and play like a normal panhandler. We like to think we can recognize quality when we see it, but we’re more influenced by external factors than by how we think we’d behave. Why Sobe makes you smarter — if you pay more (page 48). When students were given a mental acuity test and told that the drink SoBe would help with their results, they were put in 3 conditions: No SoBe, SoBe that cost $2.89, and SoBe that cost only $0.89. Why did SoBe drinkers who paid more perform much better than SoBe drinkers who paid less? If you discount tickets, you’ll get lower attendance (page 50). In a study of Ohio State’s theater department, “the people who paid full price attended significantly more shows than those who received either [a] $2 discount or [a] $7 discount.” In fact, attendance wasn’t linear: If you got a discount, whether it was $2 or $7, you attended less — just by virtue of the fact that you received a discount. If you’re an entrepreneur or consultant wondering what to charge for your services, let this be a lesson to you: In almost every case, don’t cut your prices. The key takeaway here is that we value what we pay for. We love to believe that we behave in an A–>B model: We have an attitude (“I like charity”) and our behavior follows (“…so I volunteer at a soup kitchen”). We rarely acknowledge that many of our attitudes are formed by our behavior in a B–>A relationship: “I keep volunteering at this soup kitchen (because it’s close by / my girlfriend wants me to / I need school credit / I was asked to), so I must think it’s important. For more on this, read about attribution theory. The book isn’t perfect: Though the stories are fascinating, at times the book rambles and struggles to link back to the chapter’s original point. Also, the authors are a little too fond of clever social-psychology phrases. Overall, I’m a huge fan. There were dozens of studied cited that I hadn’t heard about, and Sway uses these examples to great effect to point out examples of irrational behavior and help us understand why we act the way we do. It’s also an excellent guide for understanding why others act the way they do, and I’ve found myself thinking back to the examples while in meetings when people are acting in a particular way. It’s now permanently on my bookshelf, under the psychology section. Wouldn’t buying a book for $15 just to get a minuscule chance at $1000 be irrational? You could say the book itself is worth $15 as well, and the chance for $1000 is merely a nice benefit, but I would disagree. Instead, I’ll reserve this book at my local library. 3 out of 47? Surely you’d expect that if people couldn’t tell the difference, they’d be “guessing,” and roughly equal numbers of people would get it right vs. wrong (or equal per choice). 3 out of 47 is people actively choosing the wrong one. Are you sure you didn’t switch the cups? free gas giveaway? ZOMG. Give me 8 books. Ramit started up the Ironical Machine. Touche, Sir. I like this blog to begin with, but I REALLY like soda…so when I saw that the article began with talk of a “Pepsi Challenge” so to speak…it caught my eye immediately. I read a lot of business books, so this will very likely wind up on my reading list. It reminds me a bit of “Blink” by Malcolm Gladwell. “Chances of winning are…” …? “Sway” will arrive at my library system shortly and will be delivered to my local branch for me to pick up and read at my leisure. I’ll be reading it at the same as the Girard Reader, which should make an interesting counterpoint. It’s irrational to purchase a book for a single use, rather than to allow the library to purchase it and lend it out to all the people on the (lengthy) wait-list. I bought Sway the day it came out and read it quickly thereafter. I guess I’m out of luck for the lottery? It is a very interesting book though. As I said in my review, if you liked The Tipping Point or Freakonomics then you’ll enjoy this quick, 200+ page read. honestly? why is it that every time someone tries to do something nice, thoughtful, different, creative to stir people (rationally or irrationally) there is that “one” guy who has to criticize it? do you hate it when it’s sunny and then complain when it rains? At the risk of being the sole irrational person, I purchased the book. In my defense, I would have purchased it anyhow, as I thoroughly enjoyed “Blink” by Malcolm Gladwell, and this seems to be in a similar vein. I also recommend “Fooled by Randomness” and “The Black Swan”, both by Nassim Nicholas Taleb. Great review, Ramit. Be well. I emailed a doctoral candidate at Harvard Business School on good behavioral economics books and he told me to read Judgment in Managerial Decisions first, so I’m doing that before checking out Sway or Nudge or the other newer books on the subject. Looks very good though. neshura – while it’s wonderful that you are taking advantage of the library to read Sway at no cost to yourself, that does not make it irrational to purchase a book for single use. When you buy a book you have access to it all the time, you can take notes in it and you can lend it to other people – all very useful things. The point of this blog post was to get people excited about the book and purchase it for themselves. The gas giveaway is just an added incentive. Behavioral economics is very interesting, but does this book mention ways to apply logic to avoid making irrational decisions? I highly recommend “Predictably Irrational” by Dan Ariely which came out earlier this year for those interested in this topic. American consumerism is driven by irrational consumption. Books like these might smarten the people up to the point of aiding the ongoing recessionary trend. I purchased the book and recommended that my library purchase a copy. They’re usually pretty good about honoring requests. Influence and Moneyball are both fantastic book. I’ll be checking Sway out for sure. Let me qualify that… I’d totally win if I could time travel and no one else could, and that anyone Ramit told about this 5+ days ago didn’t enter. 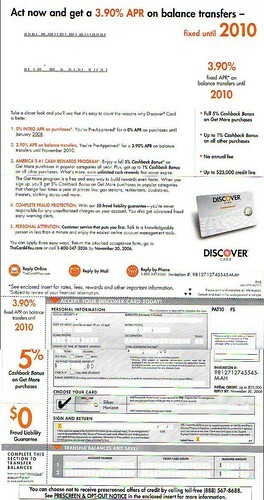 All mail-in entries must be postmarked on or before June 30, 2008 and received by June 27, 2008. So…..you have to receive the 3×5 postcard BEFORE I mail it? In regards to Coke/Pepsi, I know I can tell the difference. I’ve done tests before too, although it was only Coke & Pepsi, not the diet and generic brands too. The fact that 3 out of 47 people couldn’t tell the difference between Coke and Pepsi is meaningless. Coke is the real thing and is a far superior product to its sub-par Pepsi. I’d say more like 25% can tell the difference, if not more. Wow…so Ramit is breaking out the irony AND making money by using his Amazon referral link to this book…Good show. Gosh, Kevin, you’ve figured it out! I’m probably making insane profits from the the 3 hours it took me to write the review, plus the 2 hours to iron out the logistics of this = 5 hours for a few dollars in referral fees. Yes, that’s why I wrote the review. I think you’ve figured out my entire business model! Do you want to run my next company? To everyone else who’s not annoying and enjoyed a good book review and a fun little offer, thanks. Well, this post shut me up. Thanks for the post, Ramit. fyi: i selected the Judgment in Managerial Decisionmaking, being somewhat “academically inclined” in my selection, and interested in this area for ~2 months or so. I am interested in the nature of time and context in these selections. i,e When you read an ad and select the offer, would you have made a different selection if you had taken twice as long to select (assuming other options are on the table?) Should that become a rule of thumb? This is particularly interesting in auction-contexts, where the auctioneer controls the frequency of bids, negotiations / arguments, the purchase of real estate, etc. Also, assuming patrons of the DC subway appreciate the musical performance of Joshua Bell (in the echo chamber of the subway lobby), the intention is to get from A to B, not stop and listening to i,e “another busker”, regardless of the time of day (i,e rush hour vs non-rush hour); where one is psychologically preparing for interactions at B, not between A and B. Of course, much to the loss of the majority numb to their environment. Similarly, I had a great mortgage benefit option at the peak of last year’s housing market, which I let run-out and now (in hindsight gladly) relinquished — as the real estate market has dropped and is likely to continue. There was lots of pressure from work, family and friends to take it within the timeframe offered. Now, I sit more comfortably, knowing that if the employer values my services, they will appreciate the time in which they offer the “benefit” and re-offer i,e in 1 years’ time. Thanks for the review, I’ll prolly check out the book because of it. It’s kind of hard to recognize outstanding quality if have no idea about the subject itself….or am I missing the obvious here? I ordered the book because it sounded interesting and i’m looking forward to getting through it. The gas offer is merely an insentive to buy it early as opposed to waiting. I’m curious to know how many people bought the book and submitted their receipt and how many didn’t consider the offer because they considered it unlikely to win gas. I’ve seen Joshua Bell play at Benaroya Hall (incredible) and it doesn’t suprise me that taken out of a context of a symphonic hall that a passerby’s do not appreciate the same quality art with different presentation and audience. Very interesting expirament. Ramit, been enjoying your blog. And I generally dislike blogs and bite sized information blog culture. 90% of the variation of returns according to Brinson, Hood, Beebower ‘ Determinants of Portfolio Performance (1986). It is a very interesting post. I have been following the blog closely but I am a lurker. The Washington Post experiment is not totally fair. I have never been to DC and am not aware how many people who like violin / classical music pass that location where he was playing. I would think a good number of people would not even care about a violin and it is *NOT* a reflection on the quality of the artist nor a measure of how people *perceive* quality. It is the mode they are not interested in – here, the violin.